The 2012 Summer Olympics don’t start until late July, but qualifying events for Team USA have been going on practically since the cauldron in Beijing went dark four years ago. At least one of the soldiers who made the trip to China in 2008 will head to London later this year — Army Sgt. 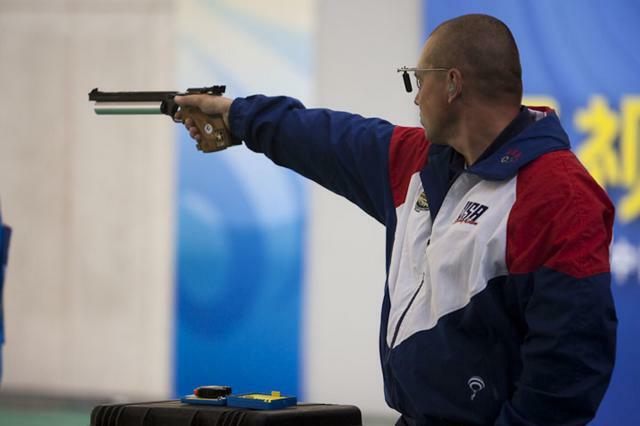 1st Class Daryl Szarenski will compete in his fourth Olympics after winning the air pistol trials. Szarenski won the 10-meter air pistol event at the 2011 Pan American Games last October and took second in the 50-meter event. He finished 14th in the 50-meter in Beijing. Army spouse Jamie Gray also will compete in the London games, earning a spot on the women’s air rifle squad. Her husband, Staff Sgt. Hank Gray, serves with the Army Marksmanship Unit at Fort Benning, Ga., according to the USA Shooting release announcing her ticket to London. Jamie Gray will train at Benning and at the Olympic team’s range in Colorado Springs, Colo., according to the announcement. The military was well-represented at the China games, with nine soldiers and four airmen taking part, including nine shooters. Stay tuned to After Action for more as the games get closer, but also check in with USAShooting.org and the Army’s World Class Athlete Program for the latest updates.